CHANCE® pipeline screw anchors provide an excellent solution for stabilization of oil, gas and other pipelines. Buoyancy is a major concern in the design and construction of all pipelines. In water or mud, an empty pipeline with a diameter greater than 12 inches can push itself to the surface if it has not been anchored. Engineering evaluations show that screw anchors are the predictable, measurable, and economical means for pipeline stabilization. Stabilization of a pipeline is based on the shear strength of the soil and/or the over-burden pressure of the soil on the anchor. CHANCE® screw anchors do not require the physical weight of the pipe or soil to overcome the pipe's buoyancy. 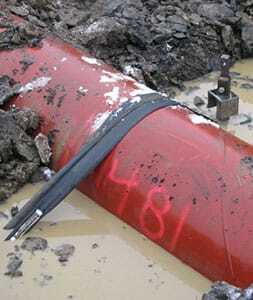 Pipeline anchors offer significant cost savings in material, installation and transportation. A single anchor, having a weight approximately 250 ft-lbs can replace 100,000 lbs of concrete in a section of pipeline.